Alpena became a base of operations for wrecking and salvage firms because of the frequent shipwrecks in the Thunder Bay region. Wreckers quickly descended on grounded or sunken vessels to recover the vessels or as much removable property as possible before the wrecks disintegrated. Jim and Tom Reid, notable Michigan salvors of the early 1900s, began their careers in the wrecking businness at Alpena. The Reids were involved in the log rafting business between Georgian Bay and Michigan that provided logs for the Alpena lumber mills. The salvage tug JAMES REID assisting wrecked steamer I.W. NICHOLAS near the Thunder Bay River in 1913. One of the most famous Thunder Bay shipwrecks was a highly prized target for salvage. The wooden propeller PEWABIC was lost on August 9, 1865 after a collision with her sister ship the METEOR. The vessels had drawn close together in order to pass messages and packages (a common practice of the day) when the PEWABIC suddenly cut across the METEOR's bow. The PEWABIC sank in just a few minutes in 180 feet of water, with the loss of an estimated 125 lives. Fifty passengers were rescued by the undamaged METEOR. 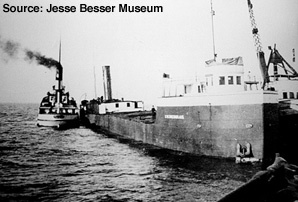 The PEWABIC was carrying a valuable cargo of copper from the Keweenaw Peninsula mines, making her a target of numerous salvage efforts. Her cargo consisted of copper ingots from four mines (Quincy Mining Co., Hancock Mine, Pewabic Mining Co., and the Franklin Mine), a quantity of barrel copper (chiseled from a large mass of native copper), and several large pieces of mass copper weighing up to 16,000 pounds each. The total copper cargo approached 200 tons. The PEWABIC also was carrying 75 tons of specular hematite (iron ore) from the Marquette area and 25 barrels of fish. The great depth of the wreck caused many of the salvage efforts to end in failure, and some in death for the divers (at least five have died while attempting to salvage the wreck). Some of the copper bars were saved from smelting by Mueller Brass employees in Port Huron when about half the cargo was recovered during World War I. The most successful salvage attempt was made in 1974 by Busch Oceanographic. Virtually all of the copper has been recovered and some artifacts, including an anchor, are on display at the Jesse Besser Museum in Alpena. 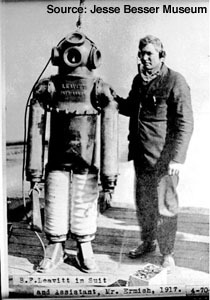 Commercial diving suit used in the 1917 salvage of the PEWABIC. Although the PEWABIC's hull is generally intact, most of the upper works is long gone, removed by salvors. The wreck today is a far cry from that reported by a 1917 salvage diver, who claimed that her rigging and structure were still intact, skeletons were in the cabins, trunks were open with clothing still hanging, and cheese and beef were in the pantry. More information about the PEWABIC can be found in Lake Huron's Death Ship by Gregory Busch, the last salvager on the vessel. Special thanks to Frederick Stonehouse, author of A Short Guide to the Shipwrecks of Thunder Bay, and contributors to the Great Lakes Shipwreck Research Newsgroup, for information about the PEWABIC.